The newly-released ANS P20 is Alfalfa Nail Supply's 20th anniversary pedicure massage chair. This exclusive massage chair increases your customer’s comfort and improves relaxation. 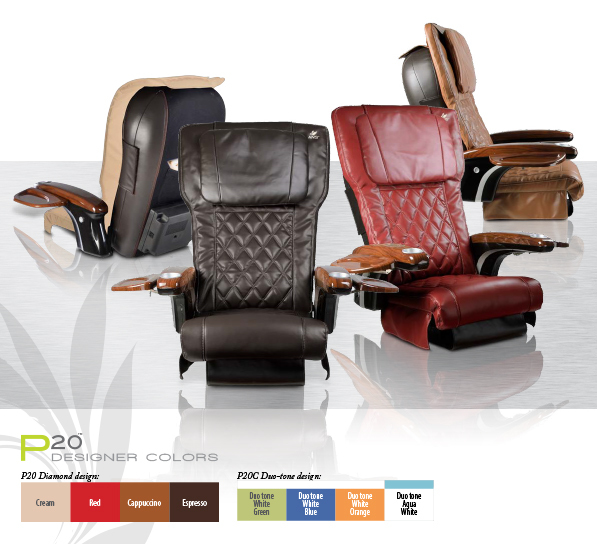 The superior-quality ANS P20 Massage features soft, stain-resistant PU-leather. Each ANS P20 is equipped with an advanced massage mechanism that includes auto and manual programs for kneading, percussion and rolling massage. For extra comfort, the ANS P20 reclines from 90 to 130 degrees, and moves back/forth up to 7 inches. For convenience, this luxurious massage chair includes an embedded control, purse hangers, cup holders, and back storage pocket. The ANS P20 also adds a touch modern functionality with 2GB of MP3 storage. Upload your favorite songs and let your customers enjoy your best playlists. Even more, the ANS P20 resists chemicals and acetone to give the chair a longer lifespan. Improve your salon and upgrade your pedicure spa to the ANS P20 Massage Chair. The premium ANS P20 Massage Chair is available in 8 beautiful colors to match the style of your salon. Each ANS P20 features soft, stain-resistant, long-lasting PU-leather. This high-end pedicure chair is also chemical and acetone-resistant to give the chair a longer lifespan. The ANS P20 Massage Chair is equipped with an advanced, shiatsu massage mechanism that feels like real hands are gently massaging your customer’s body. This innovative massage chair features auto and manual massage programs for kneading, percussion and rolling massage. Use the chair’s embedded control to let your customer’s enjoy soothing massage during their relaxing pedicure. The modern ANS P20 Massage Chair moves up to 7 inches backwards and forward using the chair’s embedded controls. For superior back support, the backrest of the ANS P20 also reclines from 90 to 130 degrees to provide maximum support and relaxation. In addition, the side armrests of the chair conveniently rotate 90 degrees to help customers get in and out of the chair. Improve your customer’s relaxation and let them pick chair settings that best fit their needs. The ANS P20 Massage Chair embraces new technology with great extras like 2 GB of media storage, USB Port, power outlet, and headphone receptacle. Connect your smartphone, upload your favorite songs and let your customer’s enjoy your best song playlists. For convenience, the ANS P20 Massage Chair comes equipped with great accessories like a purse hanger, side arm trays, cup holders, and a back storage pocket. These useful extras help make your salon more relaxing and soothing for the customer. Improve your salon and upgrade to the ANS P20 Massage Chair. You will earn 850 Points for purchasing this product. The newly-released ANS P20 is Alfalfa Nail Supply's 20th anniversary pedicure massage chair. The ANS P20 is a modern and innovative massage chair that includes many special features and functions. Each P20 comes equipped with an advanced massage mechanism that includes auto and manual programs for kneading, percussion and rolling massage. For extra comfort, the P20 reclines from 90 to 130 degree angles, and moves back/forth up to 7 inches..
For convenience, this great massage chair includes an embedded control, purse hangers, cup holders and a back pocket. The ANS P20 also adds a touch modern functionality with 2GB of MP3 storage. Upload your favorite songs and let your customers enjoy your best playlists. Even more, the P20 resists chemicals and acetone to give the chair a longer lifespan. Don't be the last salon to switch to the ANS P20. Upgrade your salon today.